This game is my submission to js13kgames, a contest similar to js1k, but instead you get 13k (for the client, and also the server), and you get to zip it (!). After competing in js1k, I was amazed at how much I could get out of 13k, especially due to the zipping. In fact, the source in the zip files is uncompressed, because using a minifier actually increased the file size. In the end: client - 11.3KB, server - 4.1KB. Making the game was fairly straight forward, except perhaps the audio, which I will explain in detail, as well as the real-time socket.io code. As you can see, each frame of animation has its own image, as well as each weapon. On the right, I merged the item/terrain atlas in the same PNG to save space. The player is 22x20px, and the items are 14x14px (some items were unused). In order to get some real-time action going, I decided to use Socket.io (as it is allowed by the rules without counting against the file-size). Socket.io is a Websockets compatibility library which uses backup transports for data if websockets is not available (Socket.io is absolutely amazing!). 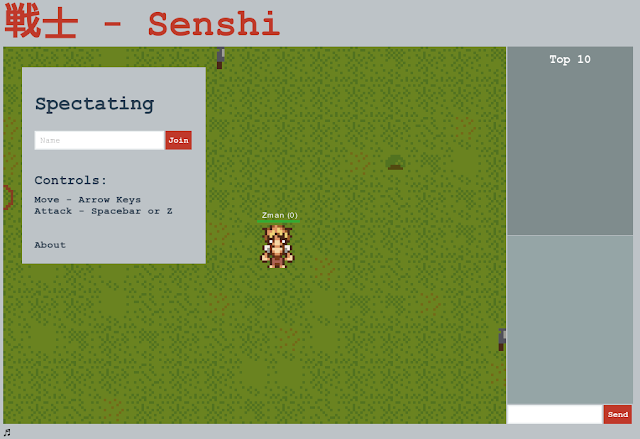 Now, notice that the player has a lot of attributes associated with them: name, x, y, health, kills, weapon, direction, animation frame, isAttacking, and the keys that they are pressing (remember, everything is computed server-side). Every tick of the physics engine, we have to update all the users positions and send the data out to all the other players. This adds up to a lot of data being sent, and exponentially increases per-player in the arena. This added a lot of serialization/deserialization overhead, however it was worth it because it drastically reduced data size. After setting up a diff-based structure, I decided to look into more ways of data compression. This website was quite helpful: buildnewgames.com/optimizing-websockets-bandwidth/. Additionally, I found this tool which looked quite promising: msgpack. Basically it defines a way to represent JSON as binary data in a highly optimized way. Sadly, I was unable to use it, not because of it's filesize, but for lack of binary data support in Socket.io - #511. Socket.io isn't perfect, but I was disappointed in that it didn't support some of the really useful data compression options available to raw websockets - #1148, #680. In the end, I went with the diff strategy, which will hopefully be enough (haven't tested at large scale). The last significant part of this game is the audio. Now, let me preface by saying that I made the audio myself, with no help, and zero prior experience. That being said, I think the audio actually turned out pretty good. Not great, but pretty good. Also, the audio data size (with decoder) ended up being ~1.3KB, which is outstanding considering that even the most trivial music goes into the hundreds of KB. With this code, I am able to simply export an array of [freq, wave] date from the editor, and then convert that into music (highly efficient). Also for those astute musicians, I decided to use a D Minor Pentatonic scale for the note range, using this scale hertz chart as reference. It's worth noting that there is still some lag due to the creation of the audio element, which you can't offload to the Web Worker because it doesn't have access to the Audio() object, or the btoa function for that matter (#55663).